I love hockey. I try to watch as much as I can. While I think the Stanley Cup Playoffs are the best in postseason professional sports, I really have no pony in this race. I couldn’t care less about either the Pittsburgh Penguins or the Nashville Predators. I just want to see a well played series followed by Lord Stanley’s Cup being skated around one of their respective arenas. However, what I’ve seen so far has been less than stellar, especially by the NHL, the officiating, and a bloviating Mike Milbury. Thursday evening, I was at a function for Wendy’s job. Towards the end of the event, I found myself sneaking out the door to check on the score at the bar next door. 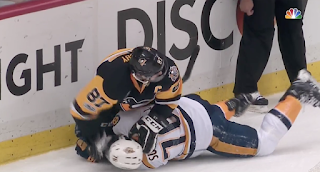 Immediately, I see a live look at Sidney Crosby repeatedly baning P.K. Subban’s head into the ice. Don’t get me wrong, it wasn’t a hard smash into the ice, and Subban had his helmet on, but it’s not necessary. The NHL claims that it wants to curb head injuries and is cognizant of concussion prevention. Player Safety wants to eradicate head shots for the good of the game and its athletes. That’s why I find it somewhat disturbing that the league has been eerily silent on the events from the game. The claim has been made that the refs were at the other end of the ice, and therefore could not call any more significant penalty. I call foul...er...false start….offsides. We may need to go to review. There is precedent for calling for punishment after the game. All the games are reviewed in Toronto. This game is no different. In fact, it may be more seriously scrutinized by the powers that be because the championship is on the line. It would be very easy for the league to make a statement. And what a statement it could be. Nobody, including superstars, is exempt from paying a penalty for blows to the head that may lead to injuries, including concussion. Obviously, Crosby wasn’t intending to make Subban’s head echo with those shoves into the frozen surface. But when is that line crossed? If he can get away with this, what to stop him from maybe putting a little extra zest on a few of those shoves? Should he be given a free pass just because he’s one of the best players in the league? I say no. In fact, he should be held to a higher standard as an ambassador for the game. And now we turn to that windbag on NBC who takes up far too much airtime between periods. Yes, I’m talking about Mike Milbury. When was the last time he made a comment about the game that was in any way, shape, or form relevant to that particular game? Each and every time he opens his mouth, he talks about the game he played. Thirty years ago. In a career that was defined by beating some jerk with his own shoe. Milbury has very obvious favorites. He’s not afraid to tell anyone who or what they are. Anyone he doesn’t like he simply makes fun of or denigrates in a variety of ways. He’s already called Subban a “clown” because he didn’t approve of Subban’s warm up technique. Now he’s said that Subban deserved to have his head slammed into the ice. But you can bet your bippy that if roles were reversed, his head would be exploding on how it was unfair to Crosby. Sometimes, I think Milbury is only on the show for the shock value of the nonsense that he spews. It’s unfortunate that NBC thinks they have to add to the inherent excitement of the game. The game has passed by Milbury. He hasn’t coached in early two decades, and his lughead style of play no longer fits in today’s NHL. As such, he is out of touch with what’s going on in front of him. I want to see the players play hockey, and I don’t want anyone to get hurt. I don’t want referees to dictate the course of the games. However, they are a part of the game, and they should police the game as unbiasedly as possible. In the name of sportsmanship, the players also need to police themselves. If you’re willing to dish it out, you better be ready to take it. Subban did exactly that. He said after the game “It’s just a hockey thing.” Meanwhile, Crosby whined all the way to the locker room just like he does after every play he doesn’t like. That’s not sportsmanship. Listen, I don’t really care for either player. That being said, I would love either or both to be on my hockey team. They’re great players. So, let’s let them play. Keep the elbows down, and the slashes out. Quit whining when something doesn’t go your way on the ice. Score some goals, make some great plays, and have fun. Because ultimately, that’s what it’s all about. May the best team win. Craig Bacon is a Sabres fan. He simply wishes they could play in the postseason sometime soon. Other than on his X-Box, that is. He is also open to a chat with Mike Milbury, but he will go barefoot to the meeting.